Shin A Lam: Why do you have to pay money to protest an Olympic judge's decision? Why Do You Have To Pay Cash To Protest Olympic Decisions? And How Much Does an Appeal Cost? 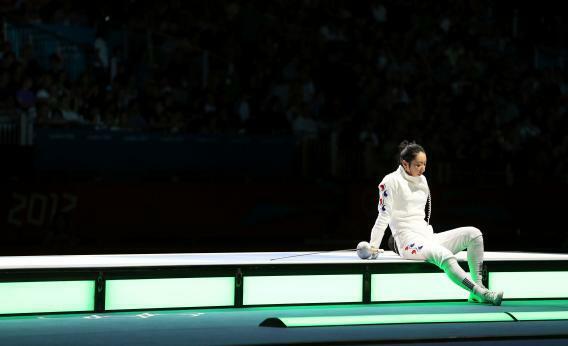 Shin A Lam of Korea sits and waits to hear the outcome of an appeal on an issue of a delayed clock that caused her to lose her bout during the Women’s Epee Individual Fencing Semifinals on Day 3 of the London Olympics. Why does it cost money to protest Olympic decisions? And how much does it cost? That means there is no single commonly accepted appeals procedure. There are at least 27 IFs running events at the Games, and each has its own rules by which athletes can lodge a protest. Some IFs require the appellant to leave a deposit, presumably to deter frivolous appeals. The Japanese team handed over a $100 bill to appeal Monday’s gymnastics rule, and since the appeal was approved that money should have been returned. Fencing appeals are slightly cheaper. The International Fencing Federation (FIE) requires that “every appeal must be accompanied by the deposit of a guaranty of US $80, or its equivalent in another currency; this sum may be confiscated for the benefit of the FIE if the appeal is rejected on the grounds that it is ‘frivolous’; this decision will be taken by the juridical authority responsible for hearing the appeal.” The International Boxing Association charges $500 for a protest (“an administrative fee of US $100 will be deducted from this amount and the remaining amount will be refunded if the protest is upheld. If the protest is rejected, the entire fee will not be returned to the protester.”) The International Handball Federation requires a deposit of 500 Swiss francs (around $511). If you’re cash poor, you should go out for taekwondo: The World Taekwondo Federation says you can appeal a decision without having to put any money down. While this mishmash may seem like just another typically confusing Olympic policy, the setup actually makes sense. The IOC has enough trouble doing its job (which is, according to its charter, “to promote Olympism throughout the world and to lead the Olympic Movement”). There’s absolutely no way it could competently set and administer the rules for every sport that’s played under its name. If the IOC was in charge, it would likely jack up the appeals price ten-fold and then promptly lose the video of the match that’s under appeal. Though Shin A Lam and her coaches might not agree, it’s ultimately better this way.